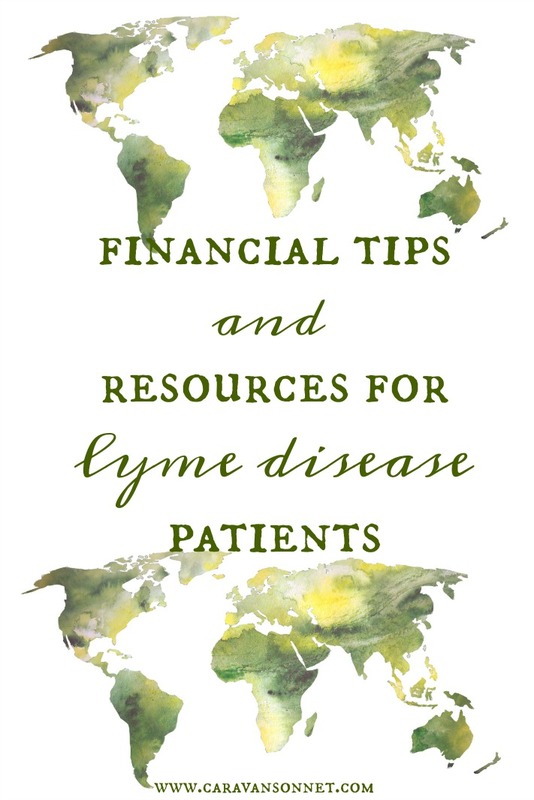 A couple of months ago I shared some "general Lyme resources" but today I wanted to share some Financial Tips & Resources with you. I want to start off by saying that I (obviously) had a "go fund me page" at one point and have had to rely on the generous donations of others to help me through at times with my treatment. I am so very grateful for each and everyone's support and help throughout this long journey. I have shared this before on this blog but as "prepared" as I was for a "financial crisis" to hit my life, I could never have expected needing the financial resources that I did. In the past four years I have depleted my savings (which, for my age, was quite large), used all financial resources I could, and continue to need financial resources to get better. This is definitely something that is VERY common with those fighting Lyme Disease. One "joke/common saying" in Lymie world is: "Want to see me get better? All I need is $150,000" . It is sad, but unfortunately true. The average cost of beating Lyme Disease is about $150,000-$200,000. And that is for those with health insurance. It can seem ASTRONOMICAL in this fight. A verse that I often meditate on is Psalm 50:10 which talks about God owning the cattle on the hillsides. The Lord will provide friends. I know it seems impossible and so many days call for difficult decisions over which medicine or treatment to pay for, but we must believe that God will provide. The tips and resources I am sharing today won't be applicable to everyone, but my hope is that it may encourage or help someone in this journey. Some things may seem "common sense" but when you are in the midst of fighting a disease for your life, they can be the last things that you think of. Some of these things won't apply due to the course of treatment that you may have chosen. But at the end of the day, I pray that these things would help encourage you and be of some help as you move forward in the healing process. (1) Understand that for a time life is incredibly different then it was before you got sick. For me some of the huge ways that this has changed is that I don't regularly get my hair cut, don't get manicures/pedicures, I don't buy make up or fancy girly things, and I can't remember the last time that I went clothes shopping. It might feel that you are being "stripped" of being a girly girl in this fight but remember that this is for a time and your health is the most important. (2) Understand that this is probably the most difficult/frustrating part of this health journey. It is ok to cry about this and feel overwhelmed friends. (1) Understand your insurance plan in detail when it comes to prescription medication. If you don't understand it take the time (and the energy) one day to talk to your provider. In the long run this will save you tons of time and energy as you talk with your doctor about which antibiotics and medications you can truly afford. Unfortunately, many insurance companies will not pay for long-term antibiotics. Instead, you will have to pay out of pocket for those. So it is wise to understand from the beginning what your plan covers. (3) Ask if your pharmacy has any "out of pocket" paying options that might be cheaper then your prescription cost with your insurance. Sometimes (which was shocking for me to discover) this might actually save you some money. (5) Some pharmaceutical companies offer financial assistance that involves your doctor writing a note or filling out paperwork to "verify" that you are in need of financial assistance even though you may have insurance. While I have done this several times and not received insurance yet, I know some Lymies who have and have received necessary medications this way. (1) It is very important to get the highest quality of supplements that you can afford. It is also important with purchasing supplements that you understand that some brands are of higher quality in the ingredients that they put in their supplements. In saying all of that one of the places that I have found to carry a lot (not all) of the quality brands at a discounted price is on Amazon. To save money (in the long run) we invest yearly in an "Amazon Prime" membership. In doing so we receive free shipping and most of the time receive our supplements within 2-3 days. While Amazon does not carry every supplement that I use, it does carry a lot of them and this has helped save a tremendous amount of money as this is a critical part of the healing process. (2) If you are in a very precarious financial situation ask your doctor which vitamins/supplements/herbs are absolutely necessary at this point. You might not need to take everything that you think you need to and there might be some other things that you should take that you aren't! (3)If you use herbs, consider purchasing in bulk. This might save some cost in the long run. (4) If you use herbs, consider contacting a local co-op or natural vitamin store to see if they carry things that you could purchase a smaller amount from at a lower cost. (5) If you use oils consider becoming a distributor yourself. I know several lymies who sell oils mainly for the benefits of earning points to receive free oils and the price cost for themselves. Some are able to make a little bit of money on the side which can also be of help. (7) Are you doing the "Cowden Protocol"? If you are I would highly encourage you to fill out the financial assistance forms. This will allow you to participate in the program at a fraction of the cost. At this time Nutramedix requires a doctor to sign the form that you are in need of financial assistance and only will cover one patient under each doctor, BUT you can use a different doctor then your Lyme doctor for the signature. For me I used my general practitioner to sign the paper. The doctor is not agreeing to oversee the process but to simply vouch that you are in need of financial assistance. (8) Looking for specific supplements at an affordable price for the gut? 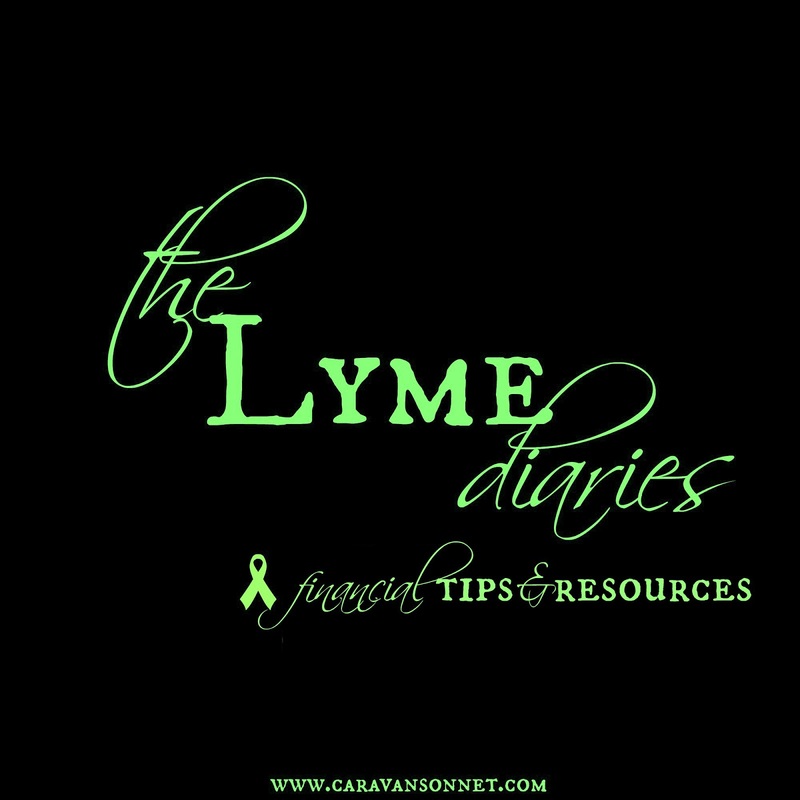 Check out my post, 10 Affordable and Helpful Lyme Disease Supplements for the Gut that you can find by clicking HERE! (1) Look at buying in bulk. While you may not be able to eat everything before it will "expire" look at buying in bulk and then freezing, canning, or baking different things. This can definitely save some costs in the long run. (2) Look at the fruit/veggies that are in season. Often times these are a little cheaper then the ones that aren't! (3) Write companies for coupons on certain products. I have done this and it is well worth the time and energy as sometimes they will even send you coupons for "free products"! Fundraisers, Go Fund Me, Etc. (1)When I made up my first "go fund me page" I had no idea what I was doing. I did some minimal research and chose "go fund me" because it had one of the least percentages of pay for fees. Over the last three years I have continued to stick with "go fund me". It was a humbling journey but one that the Lord has used time and time again to provide financial resources that I desperately need. (2) It can be humbling but accept financial help whenever it is given to you. A sweet friend from bloggy world held a fundraiser for me this past summer. It was humbling as there were not to many sales but the funds I received helped me pay for two supplements I needed. ALWAYS accept when something is given. (3) Try to come up with things that you can do from home to sell to make money. One of the main ways that I am able to pay for things that I need is through my shop, December Caravan. I am able to create most things from my bed and this has definitely helped me financially. (4) Some people do not like to just give money without understanding what the specific need is. If you are able -try to break down what the money you are raising is going towards. This can be a real help to those who would like to contribute. (5) If you travel out of state to see your doctor you might find this post helpful that I wrote last summer: How to Pay for the Costs & Expenses when Traveling out Of State or Country. There are tons of helpful hints and ideas in that post! (1) Try to use the same rental car company, hotel chain, airplane group, etc. to help build up points that you might be able to use to help cut the cost of your trips. (2) If you travel out of state to see your doctor you might find this post helpful that I wrote last summer: How to Pay for the Costs & Expenses when Traveling out Of State or Country. There are tons of helpful hints and ideas in that post! Do y'all have any financial tips for other Lymies? I would love to know!! I will be updating this page frequently so check back often for updated ideas! Thank you sweet friend!! To you too!! Sending gentle hugs and lots of prayers to you!! I don't suffer from Lymes but this is an absolutely wonderful post. I developed Dystonia when I was 22/23, and the costs are extremely high. No one ever thinks about how expensive being sick is. I've never seen any numbers on the cost of treating Dystonia, but between lost wages, copays, therapies that aren't covered by insurance, and other things that I need to stay comfortable, I can't even fathom what it will end up costing over my lifetime. You are right that your first tip is the hardest to come to terms with. I finally left my job 4 years after my diagnosis and having to switch my thoughts from "wants" to "needs" has been difficult. But, I don't need the suits, a regularly trimmed bob with highlights (oh, how I can't wait to have a nice ponytail again), or even the other costs associated with commuting and the occasional lunch out. However, it is truly humbling to be fully dependent on my husband and parents for financial (and emotional support). I think I've learned a lot about what it really means to live simply and gratefully. Although, I do miss putting on make up! I just don't need it/can't even really put it on most days. Like you, I am extremely sensitive to medications. It never occurred to me to try to purchase only a week's worth, instead of the entire month. I have an entire closet full of pills that I don't even remember what they're for! I would try them, develop some weird muscle spasms or involuntary movement (most of my problems are neurological) and then stop taking them. Your tips are so helpful and the first part about giving up the girly extras, as hard as it is, made me feel understood. I've never really spoken to or read anyone else's experiences with that. Like, my husband and I cancelled all of the unnecessary services (like satellite tv, I switched from buying books and using Audible to relying on my husband to pick up books that I reserved at the library, etc.). But, he's a guy, so he didn't quite get how sad it made me. He was also able to find a better paying job when I left mine, but that meant upgrading his entire wardrobe. (It isn't fair how much cheaper their clothes are and how their sizing is so consistent!). Anyway, thank you for posting this! It's a blessing and a resource for more than just Lymes patients! Please forgive me for the delay in my response. Your blog comment TRULY touched my heart and also was such a wonderful encouragement. I have enjoyed connecting more with you this past week through social media!! You are AMAZING lady! I have been reading through your blog and just following your story and I stand in AWE of your courage and bravery in your fight. You are my newest hero!! I couldn't agree with you more about how humbling it is to rely on those closest to us for financial (and emotional support). I am so incredibly grateful to my parents and my sister and some close friends who have truly stepped into the wreckage that disease would like to make and have helped me in so many ways. TRULY this has been some of the most important resources that they could give me- their unconditional love. I had to smile when you mentioned make up! Oh my goodness there are days where I completely miss putting that on! You might laugh but when I went on the cruise last year I knew that I would want to wear some make up. One of my friends sent me money so that I could go buy make up (as I hadn't purchased any in over two years) and so I went to buy some and realized that I didn't even remember how to properly apply it. I went to the make up counter and asked for some help and instructions. The woman looked at me like I was crazy because I was asking for help. I was embarrassed and broke down crying, blubbering about being ill. She then was OVER attentive ... hahaha what a MESS! I can laugh about it now but at the time I was reminded about how much had changed due to illness. It was definitely humbling. Thank you so much for encouraging my little heart! I am so glad that we have connected and look forward to connecting with you more! !